Sola Sisters: Propitiation? What's That? "The Bible uses a strange word to describe what Christ did for us when he drank the cup of God's wrath in our place: propitiation. What does propitiation mean? I believe that the word exhausted forcefully captures the essence of Jesus' work of propitiation. Jesus exhausted the wrath of God. He bore the full, unmitigated brunt of it. God's wrath against sin was unleashed in all its fury on his beloved Son. He held nothing back. Isaiah foretold this: "We esteemed him stricken, smitten by God, and afflicted. 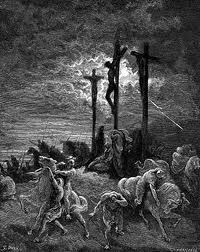 But he was wounded for our transgressions; he was crushed for our iniquities" (Isaiah 53:4-5). These words describe the pouring out of God's wrath on his Son. During those awful hours when Jesus hung on the cross, the cup of God's wrath was turned upside down. Christ exhausted God's wrath. For all who trust in him, there is nothing more in the cup. It is empty. At the end of those terrible hours Jesus cried out, "It is finished" (John 19:30; see also Mark 15:37). This was not a cry of relief, but one of triumph. He had accomplished what he came to do, to save his people from the wrath of God. And he did this by consuming it in his own person. That's why Paul could write of our being "saved from God's wrath through him" and say that "God did not appoint us to suffer wrath but to receive salvation through our Lord Jesus Christ" (Romans 5:9, NIV; 1 Thessalonians 5:9, NIV). All who trust in Jesus need never fear the possibility of experiencing the wrath of God. It was exhausted on his Son as he stood in our place, bearing the guilt of our sin."